Disney continues to try its hand at blending the world of toys and video games, with Playmation marking one of its bolder efforts. Shacknews recently went to this year's D23 Expo to try out the Avengers iteration of this new toy and see how much of a technological leap this is for children's games. Gaming is venturing into new, unfamiliar places over the next couple of years. And while Shacknews has been monitoring burgeoning trends like virtual reality, those trends are largely aimed at a more adult audience. Meanwhile, Disney is looking into the next big idea to entice kids and no endeavor may be more bold than the company's new Playmation line of toys and games. 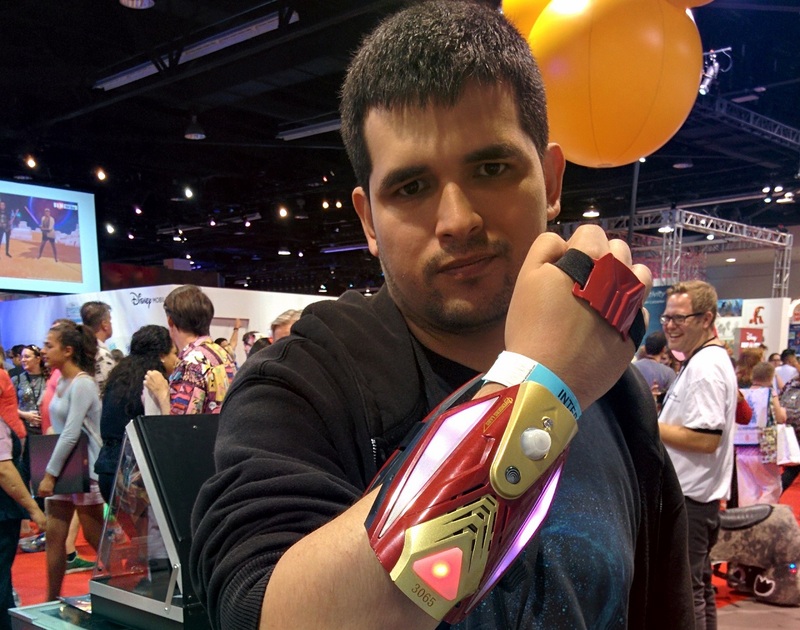 In-between covering the major announcements for Kingdom Hearts 3 and Disney Infinity, this writer took some time at this year's D23 Expo to personally try out the Iron Man Playmation toy. For those unfamiliar with the Playmation line, this is a cross between a wearable toy and a video game-style experience. In this case, it may not be Iron Man armor, but at the very least, it's Iron Man's hand. The gauntlet runs on a combination of buttons and gestures. Hitting the button along the thumb fires light shots, the button on top of the wrist fires missiles, holding the gauntlet to your chest (as depicted above) raises shields, and opening your palm will fire the palm cannon. All of it is virtual, of course, requiring more of a child's imagination. However, there is a physical feedback that can be felt, not unlike rumble technology in a typical controller. Where does the "game" element come in? Well, there's an iOS app that allows players to select their mission or download new ones. Along with that app comes a base, which can hold a hero (for an assist) or a villain (for added difficulty). When the mission begins, narrative and instructional cues will come from the speaker attached to the gauntlet. Action cues will come from the base and will vary based on color. For example, red will be your cue to shoot, while green will require you to dodge dangers. There's a noticeable light haptic feedback on the gauntlet if you miss your cue, letting you know you've taken damage. A combination of infrared lighting and motion control allows the base to detect shots, making it easy to tell when my hits registered. Eventually, the Iron Skull that was on the base was defeated, signaled by the figure literally popping off of the base. This was a sample mission I tried out, though Playmation will also feature an exploration and arena mode. More mission content is forthcoming and will be available on the iOS app. Players will also be able to check out their high scores and stats on the app, as well. No word on whether Playmation will eventually make its way to Android. 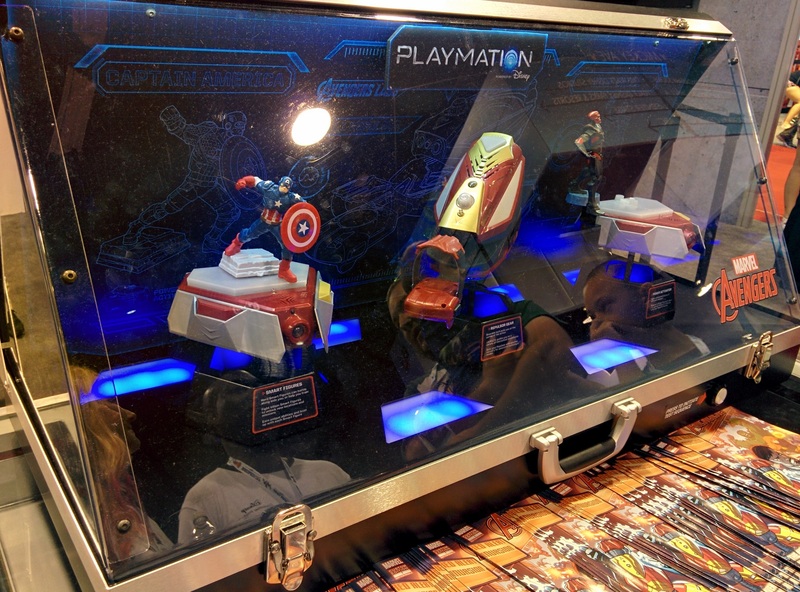 If Disney Infinity is more game than toy, Playmation goes the other way, acting as more toy than game. It's definitely an interesting idea and one that requires a little more physical activity than the average toy or video game. For a child, it's a great way to let them exercise a little more imagination with their play, just as long as they have a lot of space to play around. Definitely keep this thing away from anything breakable. The Playmation Marvel Avengers set is set to release in October, with yesterday's Disney Interactive games panel also confirming that a Hulk version of Playmation is also coming soon.